It’s easy to waltz down the grocery store aisle and fill up your basket with things that aren’t on the list. Maybe it’s the florescent lighting, strategically placed products at checkout, or that squeaky wheel on the cart that messes with your sanity—and your budget. But that doesn’t mean you get a free pass to spend like crazy! We recommend spending 10–15% of your take-home pay on food, which includes groceries and dining out. 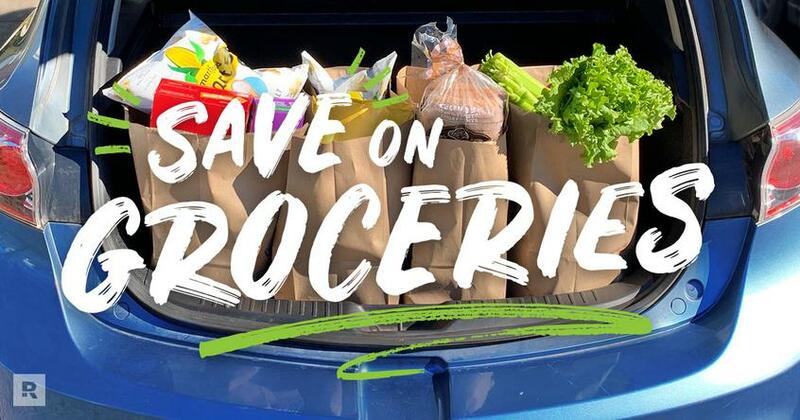 But don’t just take our word for it: Here are 25 easy ways to go grocery shopping on a budget, plus some tips from Dave’s Facebook fans! If the word dinner makes you picture a big homemade meal with a nice cut of meat, two steaming sides of fresh veggies from the farmers market, a warm loaf of French bread, and a chocolate dessert—chill out and cut yourself some slack! This isn’t 1952, and suppers don’t have to be a big feast. Your kids and spouse will survive on BLTs, omelets or a big salad several times a week. Don’t be afraid of serving simple meals. You can reduce your guilt and your budget by rethinking the most misunderstood meal of the day. 2. Crunch some numbers while you shop. If you keep a running tally of how much money is adding up in your cart, you’ll save yourself from any surprises when you get up to the checkout line. Pull out the calculator on your phone and keep track of all those veggies, fruits and other staple items you’re putting in your cart. This might make you stop and ask yourself—wait, do I really need that $5 fancy sparkling water that isn’t on sale? 3. Round up your grocery cost estimates. This is a fun little trick to play on yourself when you’re stumped for how to save money on groceries. While you’re walking around with your calculator, instead of punching in $1.59 for an item call it $2. If you round up every item’s price, you’ll still know approximately what you’re spending, but you’ll be pleasantly surprised when you’re standing at the checkout line and coming in under budget every time. 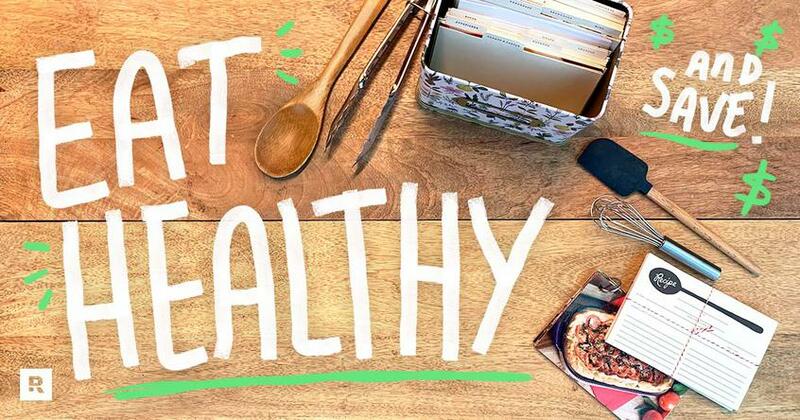 Challenge yourself to look through your pantry (or fridge) and see what kind of meals you can throw together with the ingredients you already have. Who says you have to stock up on more groceries when there’s perfectly good chicken thighs shoved to the back of your freezer and a couple cans of unopened black beans and salsa on your shelves? 5. Think before you bulk up. Buying in bulk is amazing . . . when it actually saves you money. Don’t assume that the big bulk buys at the discount stores are automatically the cheaper option. When you’re grocery shopping on a budget, be sure to stop and compare the price per unit or ounce for the item you’re buying. As tempting as it is to stock up, don’t buy more than you really need—especially when it comes to perishable items. Buying bulk cereal might be a great investment for a family of four, but if it’s just you and your spouse, that 40-count of Greek yogurt might not be the best buy. 6. Start freezing and storing meals now. Need to figure out how to save money on food fast? Say hello to freezer meals. There are a ton of freezer meal recipes online. Look them up! You can set aside a Saturday to make several freezer meals and then reap the benefits later on down the road. Not only will you save money, but you’ll also save your time. Can’t beat that! It’s like Dave always says: Cash is king! The best way to be sure you’ll end up with a lower grocery bill is to stick to the budget and pay with cash. When you go to the store with cash in hand, you know exactly how much you can spend—because once the cash runs out, that’s it! Plus, it’ll help you stick to the meat-and-vegetables necessities rather than the ice cream-and-cookie impulse buys. Those little extras are okay if you plan for them! If you still find that you’re eating like royalty at the beginning of the month and then scraping by at the end, take out cash for groceries every week instead of once a month. That way, you’ll have a better picture of how much you can actually afford to spend each week. 8. Don’t allow for budget-breaking surprises. This is one of the simplest ways to learn how to save money on groceries. When you get to the store, stick to your list! That’s the key to staying on budget. And if you go shopping as a family, let your kids help plan the meals and then find the items. It’s much easier to stay on budget when you’re shopping with a plan and working as a team . . . and when you get comfortable saying no to candy. When you’re grocery shopping on a budget, it’s super important to live by this rule. Make it a point to only buy fruits and veggies that are in season. Buying a pomegranate in mid-July will probably cost you an arm and a leg—and it might not even taste good! Instead, stick to buying fresh produce when it’s actually in season throughout the year. 10. Ignore eye level items. Have you ever noticed how the most expensive items on the grocery shelves tend to be right at your eye level? That’s no coincidence. Grocery stores are smart. They want you to go for the splurge items! Instead of falling for those marketing tricks, look up and down as you shop. The more affordable brands could be higher or lower on the shelves. Think of it as a treasure hunt for the best price! 11. Try different grocery stores. Why did you pick your current grocery store? Is it the friendliest? Is it in the most convenient location? If we’re being honest, most of us probably shop where we do out of habit. Don’t let a comfortable routine cost you money. If you’re not sure which grocery stores are worth your time and money, ask around. People who are getting the best deals will gladly gush about their favorite spots. Also, if you want to save money on food, be sure to check the weekly ads in your area for what’s on sale at competing grocery stores. You might find that shopping at the store down the street is costing extra money in the long run. Figuring out a new shopping plan may be frustrating at first, but it’s worth it to keep some extra cash in your pocket. 12. Learn the sales cycles. Are you ready to do a little detective work? Start paying attention to when your favorite items go on sale and how much the price drops. You might even want to jot it all down in a small notebook or on your smartphone. Whatever you do, just make sure you’re keeping track of those sales so you can see if there’s a trend. Soon you’ll be able to anticipate them before they hit! Nope, it’s not what you think. It’s time to bring your own bag to the grocery store! Lots of stores will give you a discount off your total grocery bill just for bringing in a reusable bag. Your savings will usually run somewhere between 5–10 cents per bag! Five bags could save you anywhere from 25–50 cents. Hey, savings are savings! 14. Don’t shop when you’re hungry. People do a lot of silly things when they’re hungry. They say things they don’t really mean, eat all of their roommate’s chips, and aimlessly stroll the grocery store aisles like zombies. And while your best friend might not hold you responsible for what you said when you were “hangry,” your grocery bill won’t let you off the hook so easily. Step away from the 48-count of frozen waffles and put back that pineapple upside-down cake from the bakery. Walk into the grocery store with a full stomach, and you might be shocked by how much lower your grocery bill is! 15. Stick to a meal plan. It sounds like a chore, but meal planning can actually be a lot of fun when you’re learning how to save money on groceries. Pick a day of the week when you’ll plan out the meals. Once you decide what you’ll make for breakfasts, lunches and dinners, write out each ingredient needed for those meals—plus a few snacks, of course. Try to use ingredients you already have on hand before you think about the other ingredients you need to shop for. And remember: A list can make or break your budget. So stick to your meal plan for the week and let your list be your guide! 16. Don’t buy more than you need. We love a deal. Everyone loves a deal. But if you get suckered into buying stuff you don’t really need, did you really get a deal at all? Buying something just because it’s on sale is a good example of this. If it wasn’t part of your planned grocery list, then you still spent more money than you were intending to—deal or no deal. 17. Test out your green thumb. This might not be for everyone, but if you can grow your own tomatoes, bell peppers and cauliflower in your garden, you’re sure to save money at the grocery store. Why? Because you don’t have to buy any of those things there! You can just go out and grab them from your garden, Little House on the Prairie style. How awesome is that? 18. Shop online and pick up at the store. If you’re looking for another hack when it comes to grocery shopping on a budget, you might want to consider using curbside grocery pickup. You can pick out the exact items you want online, pay for them, and then pick them up at whatever time works for you. A ton of grocery stores are offering this service and customers seem to be enjoying the convenience factor. But here’s why we really love it: You tend to stick to your grocery list and budget and cut out the impulse buying! That can save you a ton of money on groceries. Some stores offer it for free and some will make you pay a small fee, so be sure to budget that into your overall cost too. 19. Use apps on your smartphone. When you’re searching for ways to know how to save money on groceries, don’t forget about all the rebate apps out there! Ibotta, Receipt Hog, Checkout 51, and Walmart’s Savings Catcher are just a few of the great apps out there to help you save. 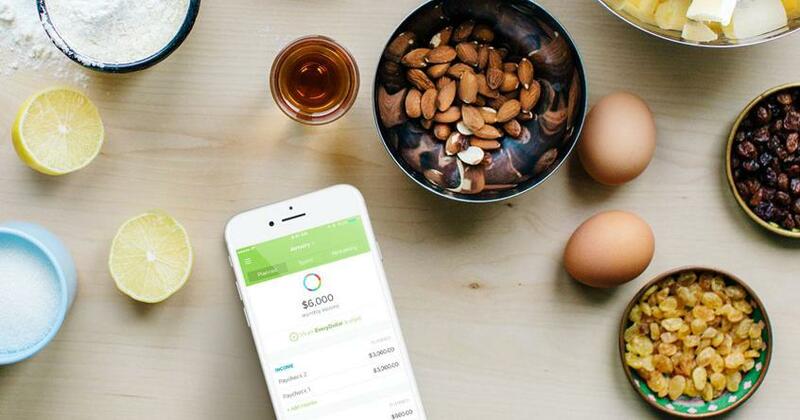 These apps let you cash out your rebates. So, you won’t receive a discount up front (like a traditional coupon) but you should see savings in the long run. 20. Try going meatless for a meal. Look here, carnivore, don’t be afraid to branch out and have a meatless meal once or twice a week. Buying large quantities of meat can make your grocery bill skyrocket (especially when the meat isn’t on sale). Instead, look up meatless recipes to whip up on Meatless Monday—or whatever day of the week you choose! 21. Eat leftovers for lunch. We all know this—going out for lunch will seriously eat into your food budget. If you’re dropping $10 just twice a week, that’s $80 a month being spent on going out to eat for lunch (and we’re not even talking a nice dinner out with friends on Friday night). Don’t waste your money like that when you can take leftovers and save a ton! “We almost always have a nice dinner every night and are really good about taking the leftovers for lunch. No matter what you cook, if you consistently eat at home, it’s way cheaper than going out all the time.” — Cindy N.
You know generic pasta is cheaper, but you’re still not convinced it won’t ruin your great-grandmother’s lasagna recipe. Are generic brands really as good as the name brands? A group of Consumer Reports “taste testers” found that most store brands measure up to the name brands in taste and quality—and they’re usually 15–30% lower in price! (1) In other words, your less expensive lasagna will taste just as delicious as Grandma’s. Still not sold? According to a study by the National Bureau of Economic Research, when buying staples like salt, sugar and baking soda, chefs were more likely to buy generic than you and me. (2) And they’re the food experts! The study concluded that if more consumers purchased store brands, we could save roughly $44 billion. With that kind of money on the line, it pays to be brand disloyal. 23. If you buy it—use it! Nothing is worse than discovering funky vegetables and fruit floating through the abyss in the back of your fridge. And to make it worse, all those rotten cucumbers and moldy peaches are dollar signs you just wasted. Ouch! Try your best to actually use what you buy at the grocery store. Put a list on the front of your refrigerator if you think that will help jog your memory. Whatever you do, just don’t let those items go to waste. 24. Only buy meat when it’s on sale. No secret here: Meat can be expensive. And if you want grass-fed beef or extra lean cuts of organic meat, the price is going to go up. So what’s a savvy budgeter to do when grocery shopping on a budget? Well, you could become a vegetarian, sure. Or you could just learn how to become a better meat shopper. Look for great deals on meat when it’s on sale. Don’t worry about it going bad before you can use it all, because you can always stash it away in the freezer. Also, look for cheaper alternatives to what you usually buy. Instead of chicken breasts, opt for chicken thighs. Skip the sirloin and use ground chuck. Pass on the pork chops and grab the pork loin. 25. Leave the over-spenders at home. Word to the wise, if you find that your kids are the culprits of adding all those “not on the list” items to your cart, you might want to leave them at home. Yes, we’re looking at you, little Jimmy with the box of cookies. On the flip side, maybe it’s your spouse who needs to stay far away from the grocery store. A few new savings habits can help you lower your monthly grocery bill, stick to your budget, and meet your money goals faster. That means more cash to pay down debts, invest for the future, or save for something fun—like a babysitter and a nice meal out where someone else cooks and cleans up. Try one of these grocery store hacks on your next trip down the grocery aisle, and you could be pleasantly surprised by how much cash stays in your pocket! Don’t have a grocery budget? You need one to truly figure out how to save money on groceries! Create your budget with our free budgeting app, EveryDollar and get ready to hit the grocery store armed and dangerous next time. If you’ve ever thought eating healthy on a budget was impossible, this one’s for you. 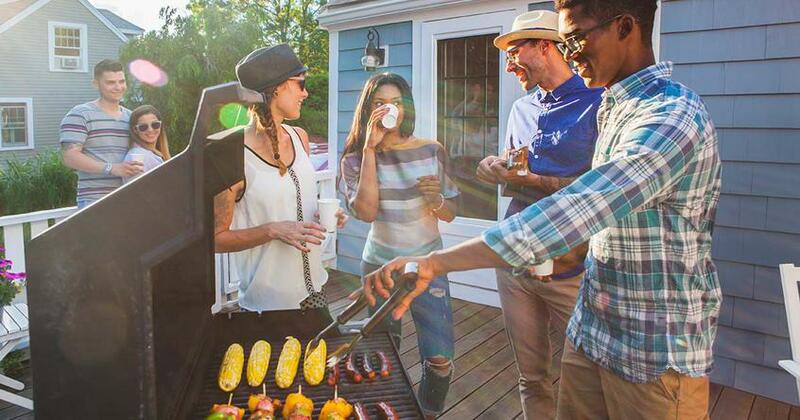 It's everything you need to throw a cookout on a budget! Try these 15 money-saving grocery store tips the next time you head out to shop. How Much Can Buying Generic Brands Save You at the Grocery Store? Is it time you made the switch?